Animal diseases, viruses and also the unfold of infectious diseases ar many of the hazards of poor animal waste treatment. Disposal through combustion is the best to bio-secure waste. All our incinerators ar appropriate for animal waste & animal carcasses. Our organization has attained expertise in this domain in manufacturing and exporting a quality grade of manufacturer and supplier ofAnimal Waste Incinerator. It is one of the most efficient equipment for disposing animal waste as well as dead animals like poultry, sheep, horses, cows and even small animals. Our dexterous workforce uses finest quality mild steel to manufacture this furnace. 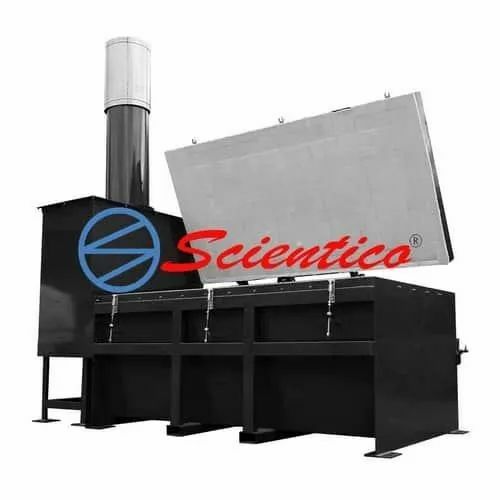 It is large shape incinerator in which the entire decomposition process happens in an energy-efficient and environment friendly manner.Animal Waste Incineratoris available for clients in different specifications as per their requirements. Large Animal waste incinerators incinerate huge dead animals like cow, pigs, buffalos, oxe etc.It is extensively used to destroy to animal infection diseases, viruses and animal waste.These incinerator are factory-made using latest technology machinery.Large Animal incinerator is double wall construction, punctually insulated with high potency ceramic bricks, with twin chambers for complete flamable their dead bodies/carcass.The heating components of those systems area unit created using nickel alloy wire. The chamber temperature is controlled by a PLC digital temperature controller.These products have separate doors for waste burning chamber and for ash collecting tray.A chimney is provided for emission of fumes. The furnace reduces most flamable solidwaste to almost 2-3 % by volume and upto five-hitter by weight.Large animal furnace area unit straightforward to put in and intensely sturdy instrumentality. it's out there invaried capacity/sizes supported the need of Forest Department, Animal Industries and Poultry farms. Leading Exporter of large Animal incinerator, Large Animal incinerator manufacturer india , large animal incinerator supplier , oil fired incinerator for large animal - portable, gas fired incinerator and hospital waste incinerator from India. Slaughter House & Pet Hospital & Farm: Dead Animal, Bio-Waste. All models with Dual combustion chamber. No or minimum installation on site. High burn rate, from 15kgs to 1000kgs per hour, up to 6ton per day. Treatment for A/B/C/D/E grade Garbage waste. New Design for pet animal cremation business. 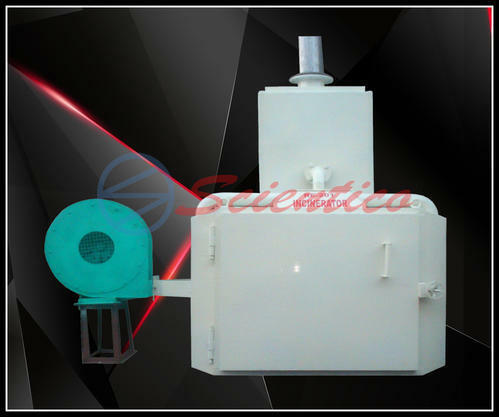 Heavy Duty Incinerator waste feed door, safe and negative pressure operation in combustion chamber. Our organization has attained expertise in this domain in manufacturing and exporting a quality grade of manufacturer and supplier of Animal Waste Incinerator. It is one of the most efficient equipment for disposing animal waste as well as dead animals like poultry, sheep, horses, cows and even small animals. Our dexterous workforce uses finest quality mild steel to manufacture this furnace. It is large shape incinerator in which the entire decomposition process happens in an energy-efficient and environment friendly manner. Animal Waste Incinerator is available for clients in different specifications as per their requirements. Livestock farms Government departments Gamekeepers Poultry farms Swine, bird crematory of all types Features:Can be installed in small spaces Natural, Propane or Oil Fuel Inside or Outside Installation Complete timers Very small ash remains We ship worldwide. Features:Can be installed in small spaces Natural, Propane or Oil Fuel Inside or Outside Installation Complete timers Very small ash remains We ship worldwide.